Youthfully sophisticated and carrying a special hidden meaning, this climber and stud earring set represent your family constellation in beautiful 18k gold vermeil. Cast from real sea stars, Catherine Weitzman"s My Lucky Stars earrings are a wearable family portrait showcasing the bonds between mother and child-each star on the right climber representing a child, and the left ear's stud symbolizing the mother. The result is an ocean-inspired tribute to a family"s most precious stars, combining hidden, sentimental meaning with contemporary design. Handmade in Hawaii. Stud earrings come with a metal earring back. A silicone stopper has been included for extra security with climbers. To secure climbers, pinch at the earring"s base to tighten the gap. For more from the My Lucky Stars Collection, take a look at the My Lucky Stars Necklace, the My Lucky Stars - 5 to 10 Stars and the Our Lucky Stars Necklace. 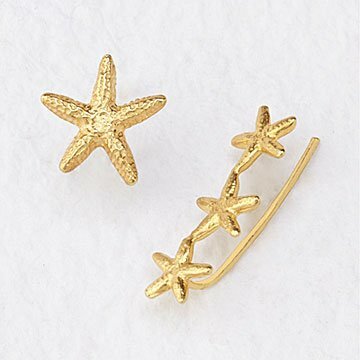 For a set of starfish studs, check out the Starfish Earrings. Cast from real sea stars, Catherine Weitzman's My Lucky Stars Earrings are a wearable portrait, offering a series of stars to represent each part of a family's constellation—the mother on one side and a climber of her little stars on the other. The symbolic nature of the design offers a special, hidden meaning for the wearer, along with a youthfully sophisticated silhouette. My Lucky Stars Earrings are packaged in 100% recycled cardboard boxes (made with 90% post-consumer fiber and 10% pre-consumer fiber), covered with recycled paper. The boxes contain anti-tarnish poly-fill. There's one place—and only one place—where you'll find the My Lucky Stars Earrings: UncommonGoods. Large star diameter: 0.5", Small star diameter: 0.3"
These earrings are so beautiful! I gave them to my mother who loves receiving jewelry. She was very happy to have some beautiful earrings that are also trendy. She loves the beach so they were perfect for her. They are great quality and will get lots of wear time! The earrings are the perfect addition to my jewelry collection. Carrying a hidden meaning, these youthfully sophisticated earrings represent each of your own little stars.